Richard Nixon grew up on a Yorba Linda citrus ranch. Ronald Reagan spent his twilight years in Bel Air. And the two Bushes? Straight outta Compton, if you'll believe it. Actually, the Bush family only called the Los Angeles County suburb home for six short months in 1949 and 1950. George H. W. Bush, the future 41st president of the United States, was on a temporary assignment to California for Dresser Industries, selling oil drilling bits for a Dresser subsidiary named Security Engineering Company. 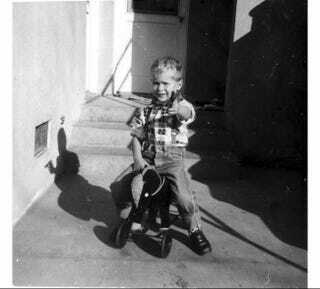 His son and the future 43rd president—pictured above playing cowboy outside the Bushes' Compton home—was only three years old at the time. They lived in a now-demolished apartment complex at 624 S. Santa Fe Avenue. The Bushes bounced around Southern California—with temporary homes in Ventura, Huntington Park, Bakersfield, and Whittier, in addition to Compton—before moving to Midland, Texas, in May 1950. Image: George W. Bush plays cowboy in Compton, California, in the fall of 1949. Courtesy of the George Bush Presidential Library and Museum.